My vision of a world that works for everyone is which everyone lives in harmony with those around them, where every human being is respected, where there is no hunger in the world. I want to live in a world in which world leaders care about their people enough not to abuse public funds and a world where inequality ceases to exist; the margin between the rich and the poor should be eroded. The most pressing issue facing the world today is that of poverty and hunger, since I live in one of the least developed countries, I see this problem first hand. The number of people living below the poverty line is staggering, and the raging unemployment is worrisome. The world is also faced with a problem of insufficient distribution of scarce resources to every human being that exists. Most people do not have access to clean drinking water and suffer from numerous diseases as a result. Also of great concern in the world is the issue of incurable diseases. Africa is faced with high HIV/AIDS prevalence, targeting mostly women in the working class, leaving children parentless, vulnerable to the responsibility of heading up families. The world is also faced with the problem of visionary, exemplary leaders to serve as role models for the communities they lead. I think in order to solve the problem of high rates of poverty and food insecurity, there should be support grants given to the less fortunate so that they can start projects of their own. I believe business is life, and should play an integral part in everyone’s lives. The poor could be given up startup capital to fund agricultural projects in which they should practice commercial farming and sell to industries and the world at large. In order to solve the issue of rising unemployment, I think technology should be adopted in less developed countries, technology boosts businesses, helps to create jobs and provides linkages with a wider market. Employ mechanisms of eliminating the current disparities of income distribution between the rich and the poor and work towards inclusive shared growth. There should be transparency in order for corruption to be eliminated from the facets of this earth, leaders who are found guilty of rent seeking behavior should be held accountable and be brought before the law to receive their penalty due. Strides should be made in making everyone aware of the risks of contracting diseases such as HIV/AIDS, as prevention is better than cure. As for those already affected with the disease, the community should be educated on the disease so that they do not stigmatize those infected with the disease. Youth involvement in key strategic developments of the country should be considered as they are the future leaders of the world. Mantsebeng Suzan Maepe is a 21 year old Mosotho girl born and bred in Maseru, I am a freelance writer, travel fanatic and philanthropist. I am a very vocal person, a social activist against women abuse, a peace advocate, and a child and youth activist. I love reading, and have loved it since I was barely six years old. This was unusual because in my family, there was no one who actually nurtured this love of reading, I actually cultivated it myself. I still recall the first book I fell in love with, the secret garden. From there my interest was aroused and I have never looked back ever since. Some of my favorite authors include Danielle Steele, Mary Higgins Clark, JK Rowling and Jane Austen. I am also a self- confessed magazine addict. I love reading articles and learning about how the world functions. When I was in primary school, I won my first phone through writing a letter to a magazine in the neighboring South Africa. To a young kid of 12 years, that was a huge accomplishment. Right now I am currently interested in business magazines, as I am an aspiring entrepreneur, I believe in business and that it should be a way of life. I am currently running a small business on the side, selling cosmetics products as a distributor of Avon products. My hope is that one day, I found a company that will not only create jobs for the community but also answer the pressing needs of the community. I believe in social entrepreneurship and believe it will go a long way in helping us achieve inclusive growth. 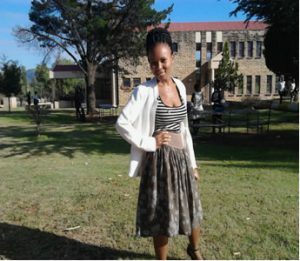 I am currently studying for my bachelor of arts in Economics at the National University of Lesotho, doing my third year. I stay in the capital city of Lesotho, I am the third born in a family of four children. I am a driven, self-motivated young lady who thrives on making a difference in other people’s lives. I volunteered at the Dream foundation in Lesotho which is concerned with nurturing and building future leaders of Lesotho. I worked as a children’s facilitator at a program called Reading for development, of which I am very passionate about. I believe in the saying that “Great readers are Great Leaders” and I wanted to change the misconception that black people do not read. There after I also volunteered at the Red Cross society where we engaged in a number of issues. Some of them being; raising awareness about HIV/AIDS, the importance of donating blood, working with several charities also. I am also an adventurer who loves outdoor activities; currently I am in a youth OAK association in which we participate in outdoor activities such as hiking, camping, canoeing and kiting and visiting new places. Through these activities, my endurance is tested as well as my ability to overcome my fears such as my fear of water. I am a music lover who loves pop music, hip hop, jazz, dancehall, house music and reggae. I love being African, I have natural hair and advocate for women to love themselves the way they are. I have also worked on the committee of Miss Crown Royale, a beauty pageant contest that was done in commemoration of women’s month. The pageant was a huge success and further instigated my passion for event planning. I love service above self, hence why I am also a member of the Rotaract club at my school. The club helps those less fortunate and works on projects that have a lasting and significant change in the lives of people it serves. Above all I am passionate about women and girl empowerment. My hope is to have a foundation that focuses on girls, helps to mentor them into admirable women of substance. I would like to live in a world where a boy child is treated the same way as a girl child. I would like pursue motivational speaking, from the younger age groups in primary schools and high schools, till the tertiary and working class, inspiring them to live to their highest potential ever. I also want to travel the world, learn new cultures, and engage with people from different backgrounds. My dream is to have a published novel, be an editor of an award winning magazine, be a social entrepreneur who has created numerous jobs and to also continue with my philanthropy work.